Published: Friday, February 8, 2019 Do you want to check your installed pyranometer on site? With the new METEON 2.0 handheld data logger you can connect directly with any of our pyranometers, Smart or analogue, and see real-time measurement values. Simple, quick, convenient and accurate. 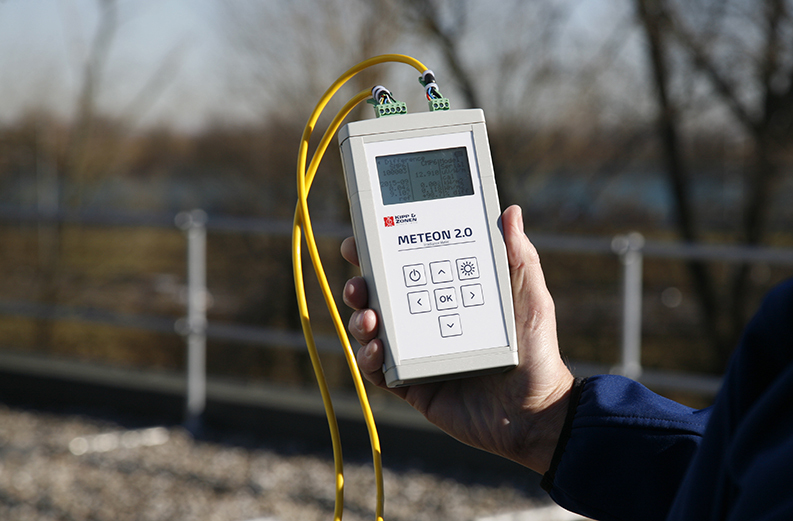 METEON 2.0 can be connected to any of our pyranometers and provide you with the real-time measurement values. Helpful when, for example, you want to check if your site pyranometer, data logger and data acquisition systems are working properly after installation. Or, when you want to validate the incoming irradiance by comparison to a reference pyranometer. METEON 2.0 connects with and powers up to 5 of our Smart radiometers (not just pyranometers) and enables you to easily set up the Modbus® address and communication parameters of the sensor on the spot without using a computer and software. You can also connect one passive instrument with a millivolt analog output. When it comes to education and training, METEON 2.0 proves to be an insightful tool for presenting irradiance measurements without any complicated setup. It is battery powered and comes in a rugged carry-case, with space for a pyranometer as well, making an ideal field test kit. 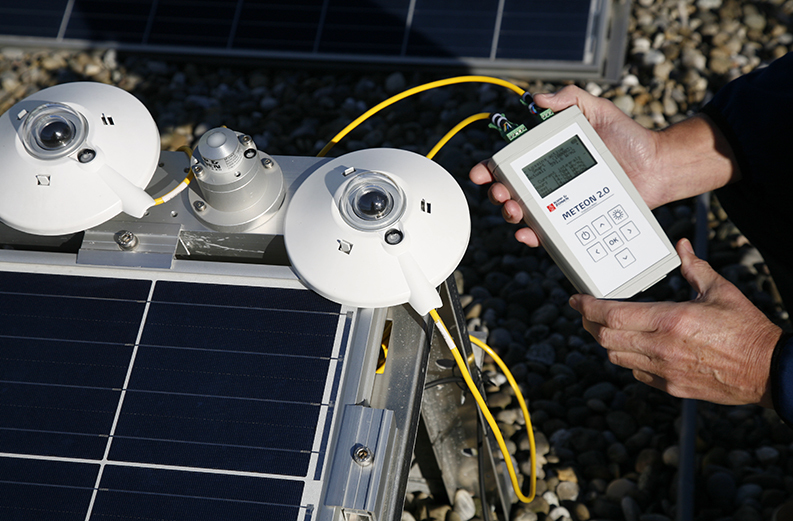 METEON 2.0 can be of great help when you are responsible for the maintenance of a solar energy plant. To check if the pyranometers are installed correctly, to validate their data and to check if the whole system is working properly. But, it can also provide you with the basic parameters you need to calculate the performance ratio (PR). For PR you need to know the incoming plane of array solar irradiance (measured by a pyranometer and displayed and recorded by a METEON 2.0) and the electrical energy generated. Therefore, the METEON 2.0 can read the pulses from a kWh meter (S0 output). And don’t forget that the module temperature is required; you can also hook up a Mencke & Tegtmeyer Modbus® panel temperature sensor. 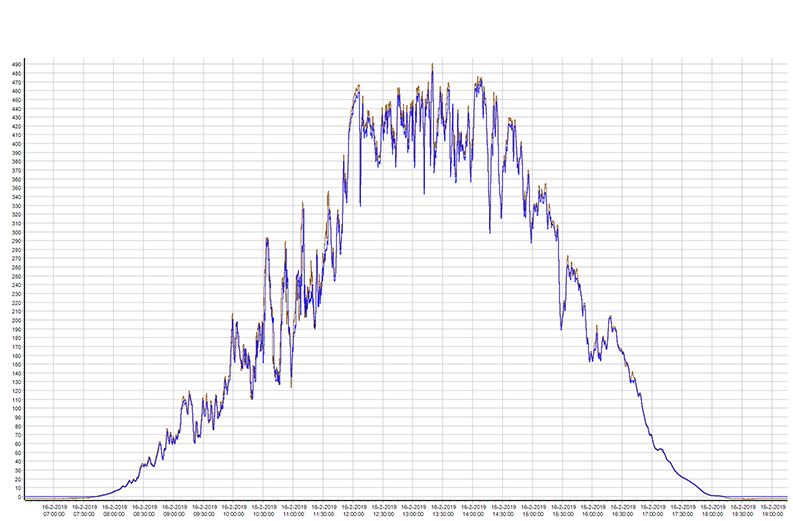 With METEON 2.0 you have a very easy way to check the efficiency of your PV plant in real time and on the spot. As mentioned, METEON 2.0 can connect with multiple Kipp & Zonen Smart instruments, which means that it can be used with two SMP pyranometers to measure the incoming and reflected solar radiation in bi-facial PV applications, to calculate the albedo. Displaying the measured irradiance is possible with the original METEON, but it does not have a real-time clock so you need to reset the time and date for the data logger each time you turn it on. With METEON 2.0 this is no longer necessary because it has a built-in real-time clock with battery back-up. You can view and compare live data on the display and, depending on the number of instruments connected and the logging interval selected, it can store weeks of data. You can export the logged data files to a Windows™ computer using the USB interface. Once downloaded, the free METEON 2.0 software visualizes the data nicely in a graph and it can be exported to Microsoft® Excel for further processing. METEON 2.0 can measure, display and log values from up to 7 devices; 5 Smart, one analog and a M&T panel temperature sensor. It can also count pulses from an energy meter. Smart devices can be Kipp & Zonen SMP, SHP, SGR or SUV series radiometers or the RT1 Smart rooftop monitoring system. Our passive radiometers with millivolt outputs can be used with the analog input. METEON 2.0 gives you the possibility to compare your local pyranometer (device under test, DUT) with a reference pyranometer to verify its performance and calibration factor, by logging the difference between the two, and a measurement report can be presented. Click here to read the specifications and request a quote.